What Is The Best High Frequency Workout Routine? What is the best high frequency workout routine? Increase mass and recovery time with these full workout programs from our forum members! That and more right here. Try them now! TOPIC: What Is The Best High Frequency Workout Routine? A high frequency working regimen can be grueling but effective. What is the best high frequency workout routine? Be specific. What are the benefits to this type of routine? What are the drawbacks from this type of routine? How can you avoid overtraining when following a high frequency routine? Bonus Question: Have you ever used a high frequency training regimen? If so, how were the results and would you recommend it to others? High frequency workout routines can be a great training style for quickly increasing muscle mass and improving the body&apos;s recovery ability. This training style is not as popular as other traditional routines but those who have used high frequency programs know how effective these routines can truly be. The best high frequency workout routine will focus on mostly compound exercises because they will give you the most "bang for your buck." This program will also slowly increase the frequency of workouts over a period of several weeks rather than suddenly throwing your body into 6 workouts in one week. The first week of this program will consist of 3 full-body workouts. Over the course of the next few weeks, the frequency of workouts will increase to a total of 6 workouts in one week. The rep schemes in this program will be kept to a total volume of 18-50 per exercise (volume = sets X reps). A different rep scheme will be used each workout of the week. The more variation in rep schemes the better off you are (the variation between 3x8 and 3x10 is not as good as the variation in 6x3 and 3x10). Rest periods between sets should be kept between 1-and-2 minutes. Higher rep schemes will have slightly longer rest periods and lower rep schemes will have less rest time between sets. Try to avoid training to failure while working out on high frequency programs because training to failure will require more recovery time - which you won&apos;t have on this program! This week will be the start of twice-a-day training. Have at least 6 hours of rest between AM and PM sessions. Click Here For A Printable Log Of Day 1 AM. Click Here For A Printable Log Of Day 1 PM. Click Here For A Printable Log Of Day 5 AM. Click Here For A Printable Log Of Day 5 PM. Click Here For A Printable Log Of Day 3 AM. Click Here For A Printable Log Of Day 3 PM. You&apos;ve finished! Take 5 days completely off to allow your body to recover before beginning your next workout program. The biggest benefit and most obvious reason anyone would undertake a high frequency workout routine is that the increased frequency of training can be great for quickly increasing muscle mass in many individuals. This program can also be an excellent training strategy to increase your body&apos;s recovery rate. This could be good for athletes as a way to prepare for the multiple practice sessions they will participate in when their season starts. Higher frequency training can also lead to better fitness levels than a traditional bodybuilder type split because you will be working your entire body multiple times per week rather than working each muscle group only once every week. One drawback of high frequency workout routines is that they require more time in the gym than other workout programs. This can make it hard (or impossible) for people with busy schedules to follow high frequency programs. Another potential drawback is that workouts must be of slightly lower intensity than that used on other programs. High intensity training techniques such as drop sets and rest paused sets cannot be used because they will require more recovery time. The increased training frequency can also potentially increase the risk of overtraining. The best way to avoid overtraining while training on a high frequency workout routine is to not train to failure. Always keep at least one rep "in the tank." While training on a high frequency program, you should ensure that your caloric intake exceeds your caloric expenditure. Recovery techniques such as massages and contrast showers will also help in your fight against overtraining. [ Click here to learn more. ] High Frequency Training: Avoid Overtraining! If you do begin to experience several of the symptoms of overtraining, immediately discontinue your program and take 5-7 days off before returning to the weight room. Some of the signs of overtraining are an elevated resting heart rate, injuries, irritability, depressions, lack of motivation for working, trouble sleeping, decreased hunger and weight loss (Mondey). Have You Ever Used A High Frequency Training Regimen? If So, How Were The Results And Would You Recommend It To Others? I have trained on several high frequency workout routines and have loved the results. 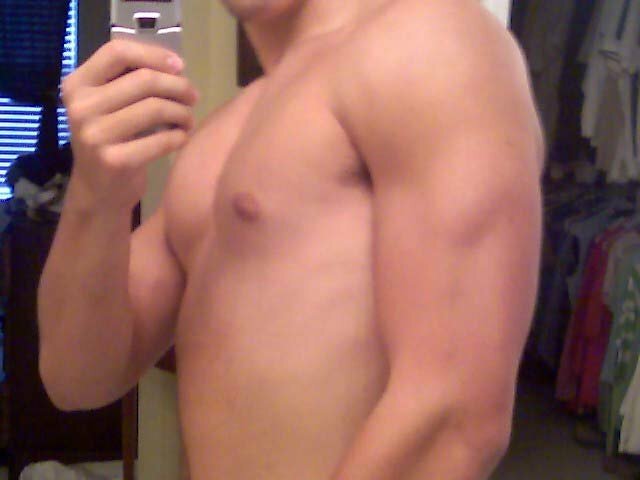 In quick periods of time I was able to increase muscle mass rapidly. I have frequently recommended this style of training to others because I feel it is a great training style that could benefit many people. Mondey, Fawnia. Overtraining Signs & Symptoms. This routine should be used for 6 weeks. The first week should be an introduction to the High Frequency Routine. Follow a basic 3-day workout for the week in order to assess your bodies tolerance and to allow for recovery. Rest periods between sets should be kept between 1-and-2 minutes. Follow the 5 basic exercises and feel free to change the exercise for each day if needed. Stretching for 15-30 minutes is an ideal goal after each workout. Click Here For A Printable Log: Day 1. Day 2. Day 3. That&apos;s it. Take 1 full week off to allow your body maximum recovery. Go ahead and start the next routine. There are many benefits for this kind of routine. Bodybuilders will often use high frequency routines in order to shock the body with a new workout regimen and put some mass on their body frame in no time! Athletes will use these types of routines to prepare themselves for the hardships of the season and the long enduring hours of practice and games. Higher frequency routines can also be used to increase rep ranges for certain exercises such as pull-ups in a short amount of time. Users following the routine will need to dedicate a lot more time in the gym, than a normal weight lifter. This can cause problems for someone with a busy schedule who can only get in quick lifts. Another drawback is that the workouts need to be of lighter weight in order to allow for faster recovery. Because the workouts are of high frequency and are used often, there is not as much time for recovery. One final drawback is the potential hazard of overtraining, this could be caused by doing too many exercises or using too much weight. The biggest factor in avoiding overtraining is never going to failure during a workout. Going to muscle failure during a workout will cause your body to have a longer recovery time, which will inhibit your high frequency training. Overtraining can have some serious consequences and needs to be watched out for with a keen eye. If you notice any of these symptoms chances are you have overtrained. The best thing to do is REST. Continue eating and sleeping normally. Give your body 3-5 days to recover and then alter your workouts and make them a little easier, until you can find a good regimen to help you avoid overtraining. I have used a high frequency training regimen several times for sports and for my own personal gains. In certain exercises such as pull-ups I was able to increase my rep range from sets of 10 reps to sets of 15-18 reps in a short period of time. Using high frequency has also allowed to be pack on muscle quickly and it is a nice change up from the usual heavy weight low reps routine. A high frequency working regimen can be grueling but effective. Acceleration, recuperation and muscle mass gains are only a couple of the benefits one can experience. High Frequency Training delivers fast results when paired with a solid nutrition foundation. Click Here For A Printable Log Of This High Frequency Workout. This workout is a simple full-body routine which shouldn&apos;t take long to complete. Use a MODERATE weight which isn&apos;t too heavy that the last rep is a complete struggle nor too light where the load feels inexistent. Focus on one&apos;s weaknesses. Perform this workout 4-5 times a week (I suggest Sun-Tues and Thurs-Fri). Consider that with this high frequency, the intensity level should be low-moderate. Rest times can vary from 30-120 seconds. Enough should be accomplished that one knows they just stimulated growth without feeling sore. High Frequency Workout (HFT) routines increase size, strength and the ability to recover. When following this approach to training correctly, each training session acts as active recovery from the previous trip to the gym. HFT also allows partakers to complete a workout feeling invigorated instead of nauseous and on the verge of collapse. "The great thing about this type of training is that you will build strength without ever making yourself tired, because the body is adjusting naturally and rhythmically." This type of training promotes recovery and improved fitness due to the high frequency. Being able to recuperate faster while being in better shape to begin with provides a crucial edge over the competition. There is a lot of carry-over from HFT to the real world. One drawback from a High Frequency Training routine is lack of motivation. Frequent workouts may become monotonous and lessen the drive to get to the gym. Spice things up with occasional exercise alternation. Just remember that the monotony is worth the results. Overtraining also poses a risk with HFT. If one trains to exhaustion then they will be too sore and unable to have a productive training session the next day at the gym. The key is to train with a level of intensity that allows one to leave the gym refreshed with a sense of accomplishment instead of limping out from throbbing legs. Another possible drawback is doing more harm than good through an insufficient diet. Failing to account for daily exercise, macronutrient (protein) and micronutrient (vitamin and mineral) requirements, and falling short of a caloric surplus will not only limit muscle growth, it may destroy previously hard-gained mass when subjecting the body to a continual caloric deficit. Unfortunately these programs require more time in the gym than usual which may not be convenient or even possible for individuals at any given time. I suggest going to the gym and doing bodyweight workouts at home when in search of a HFT program for those on the go. Overtraining can be avoided by acknowledging - and further - BELIEVING, that one has accomplished something and had a beneficial workout without going to the extremes of complete exhaustion. Although it is a high frequency program, that does not mean it should go hand-in-hand with high volume. Stick to the workout provided using a sensible weight which isn&apos;t too heavy nor too light and staying within the suggested rep range. Further ways to avoid overtraining include getting a full 8-10 hrs of sleep a day (with additional power naps) and consuming a rich, nutritious diet that prevents any nutrient deficiencies. [ Click here to learn more. ] The Benefits Of A Good Night&apos;s Sleep! Getting the rest we need keeps our eyes bright and our energy levels high. Here I will share some tips and benefits regarding the importance of sleep. When I began training there was a period of a couple weeks where I frequented the school gym often with "the more the better" mentality. I didn&apos;t know about HFT - or any real form of training yet - as I practiced the basic HFT philosophy. At this point, I only used a moderate weight and was able to avoid overtraining. My personal gains surpassed those of my friends who were on a separate program. I haven&apos;t used a High Frequency Training regimen since but I would recommend it to anyone who hasn&apos;t given it a try since this form of program is a lost workout regimen that delivers results.